This 6x4 photo album is perfect for 200 Summer Holiday 6x4inch photos with a sandy, beige front cover and a beautiful printed photo of a pebbly beach, with a cystal clear sea and a couple of sun loungers, that are crying out to be slept on. The sandy background continues onto the back of the hard covered album and the shells and a haunting grey replicated image of the front, give added interest. 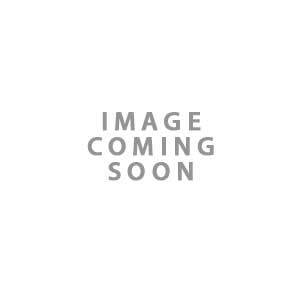 There is a jazzy pattern around the bottom of the cover and the front image is also printed onto the top of the spine, so that the album can be identified when on a shelf. 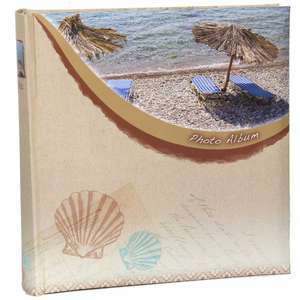 The Beach Umberella Photo Album measures approximately 8.25 x 8.75 inches overall and takes the photographs in clear, plastic pockets one above the other in landscape mode, with a memo area at the side of each pocket on which to write notes. The bookbound slightly spotted, white pages are made from good quality card and the plain memo area has six black lines to keep the writing neat and the clear plastic dust jacket, keeps the album clean.